Construction on the Argyle Cut began in 1843 and was completed in 1864. It consisted of a roadway passage carved through the centre the large sandstone rock mass which lay at the back of The Rocks precinct. The Cut provided an alternative passageway for transporting shipping cargo from the docks into the city centre. Its precise engineering and clean lines made it a sophisticated feature of the otherwise disreputable Rocks area 1. 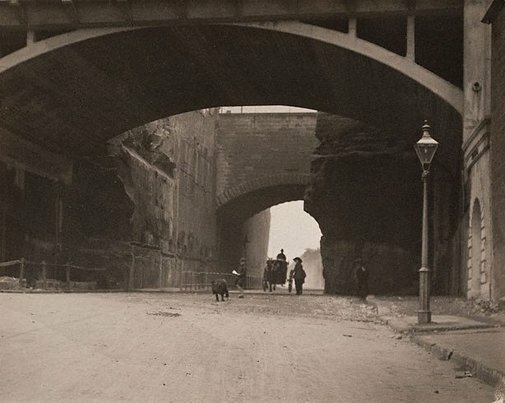 Pictorialist photographers like Cazneaux were attracted to the Cut on account of the light and form of the passageway 2. In the Argyle Cut the two overpasses frame the photograph’s silhouetted subjects. The light in the picture comes predominately from the end of the passageway, further focussing the viewers’ attention on the carriage, mother, and her dawdling children, who appear enveloped within the shadowy roadway structure. Not signed. Dated c. verso, pencil ".../ c1912".